This morning as I got out of bed, I glanced out the window and saw a deer grazing right outside. I snuck out to the living room and got my camera, and then snuck back into the bedroom and began taking video and pictures. I realize that you all may get tired of deer videos, but I’m so thrilled that I can’t help but video them and share them. A bit later, I heard EJ whisper urgently for me to come into the bedroom. He also saw a deer grazing when he woke up. We haven’t yet mowed our lawn because we just brought the mower up last weekend and we haven’t had time. However, we discussed mowing very little of our yard so we can provide habitat for the wildlife. Of course, we couldn’t mow much of it anyway because we live on the top of a hill and there is forest and ravines around us. But we purposely want to leave as much of it unmowed as we can. We were sitting in the living room drinking coffee when I happened to glance toward the kitchen window. “Oh, my goodness! Someone is here!” I gasped in shock. We don’t really know anyone yet and we are so surrounded by trees, ravines, and a long steep driveway that I’m always shocked when I see a strange car. And, actually, I haven’t seen many strange cars come up the driveway. 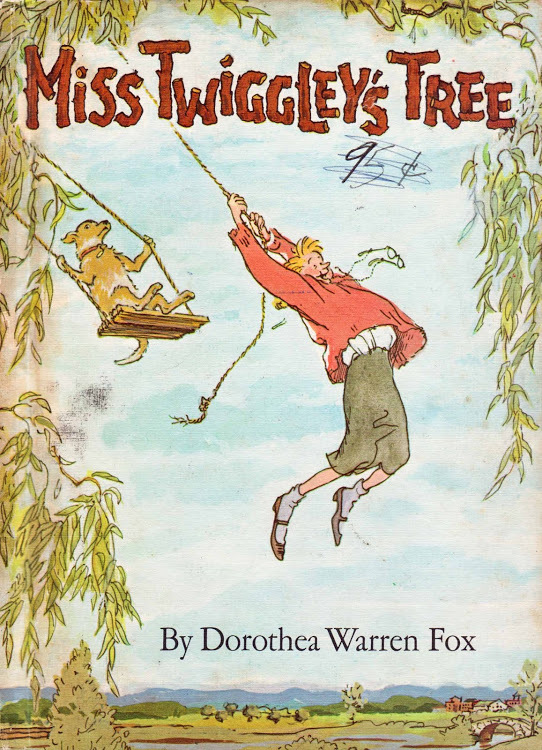 I always liked that Miss Twiggley lived in a tree with her dog, but I decided to go out and join EJ and the women, so I did. We had a nice little chat and EJ said later that he had told them about what we believe. It’s only fair, if they are going to come to our door, that we (or rather EJ) share our faith as well. 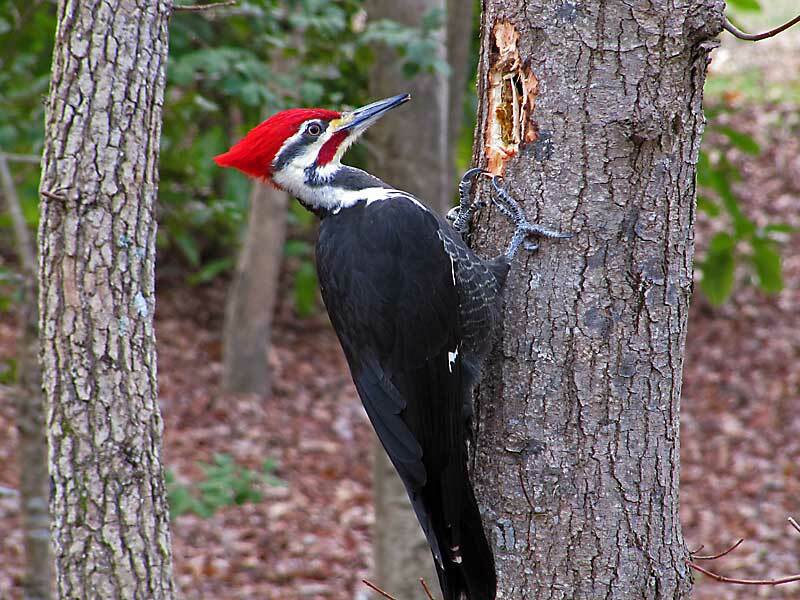 “The Pileated Woodpecker is one of the biggest, most striking forest birds on the continent. It’s nearly the size of a crow, black with bold white stripes down the neck and a flaming-red crest. Look (and listen) for Pileated Woodpeckers whacking at dead trees and fallen logs in search of their main prey, carpenter ants, leaving unique rectangular holes in the wood. The nest holes these birds make offer crucial shelter to many species including swifts, owls, ducks, bats, and pine martens. EJ just caught a glimpse of it. Later, when we were in the house, we saw it pecking at a tree. I was so absolutely delighted! I’ve never seen a pileated woodpecker before! I so totally love the Enchanted Forest! After my guys left for work, I did a few tasks. First I hung a couple pictures in the living room. I will want advice for hanging the others–like where the studs are in the wall and such. Then I took pictures of the newly painted room. The room was blue when we first moved in. We painted it a creamy color. I think it looks much better. One of the pictures I hung. Then I did a live chat with a Lexmark support technician to find out why my computer and wireless printer haven’t been communicating since I brought the printer up to the Enchanted forest. The technician worked with me for a couple of hours and, well, to sum up, I have to find the USB printer cord, which I’m quite sure is still at the old house, then do what my computer tells me to do, and somehow that will get the printer to communicate again. I also did laundry. I wanted to wash the jeans I was wearing, so I put on my sweatpants that I wear as pajamas and a pullover sweater. It’s not like anyone ever comes up the hill. Except for this morning. I was folding clothes when I heard this big roar, and I looked outside and two trucks drove up the driveway. Oh, my goodness! I rushed around trying to find presentable clothes to put on, hoping I could find them before the people knocked on the door! I finally found the clothes, got dressed, and went outside. Two guys were consulting in the driveway. They were the guys that are going to fix the driveway. Well, the first guy is actually the one EJ called about getting gravel. He arranged for us to meet the second guy, who has expertise in fixing driveways like ours. The second guy is going to come out tomorrow to measure the driveway and write up an estimate. And so my day pretty much ended the way it began: With me wearing pajamas and panicking when strangers came to my door. You are brave. I would be a wreck with strangers at the door. I really like the color change on that room. The other color was off with the carpet. This is nice and I imagine such relief as each task is completed. I do love the color of the room. It is soothing, unlike the blue. We plan to take out the living room carpet and put in new flooring. We wanted wood, but it costs too much so we will put in vinyl flooring that looks like wood. It’s easy to clean up. With so many pets, carpet just isn’t a good option.